Senior Amy Ahlers recently received All-State honors to cap another terrific season for the Boone Central girls golf program. 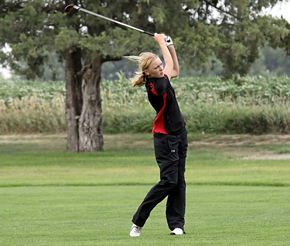 Boone Central Golf Coach Dennis Walters announced last week that Ahlers was selected as a member of the 2012 All-State Girls Golf Team by the Nebraska Coaches Association Board of Directors and Sports Advisory Committee. The Nebraska Coaches Association has established guidelines and chooses All-State teams in those sports not receiving recognition by the Nebraska daily newspapers. Ahlers is the third Cardinal to receive NCA All-State honors, along with former teammates Brooke Bolin and Brittany Seda. Amy, daughter of Terry and Nancy Ahlers of Albion, had an extraordinary 2012 senior season to highlight her decorated career, winning 10 straight events before placing third in the Class C State Tournament at Quail Run Golf Course in Columbus. Included in those victories were her first Mid-State Conference and District championships. She won the Wayne Invitational (the season’s largest event with 86 competitors) for the second straight season. Amy broke the Albion/Boone Central school record for 18 holes with a score of 72 in the Pierce Invitational, set a new Mid-State Conference scoring record of 76 and tied the school nine-hole record at 34. As the lone Cardinal senior in 2012, Ahlers led an inexperienced Boone Central team to impressive results, Walters noted. “The girls had a very successful season again,” Walters said. “As a team, they won the Fullerton dual and a triangular at Columbus Scotus, won three tournaments and were second in two others. With junior Faith Leetch forced to miss the season due to injury, sophomore Melissa Kyncl was the only other Cardinal player returning from the 2011 state championship team. Kyncl showed dramatic improvement in 2012 and formed a terrific 1-2 punch with Ahlers. She finished runner-up to her teammate five times and placed third in three additional tournaments, including the C-3 District. Kyncl was the 14th place medalist in the Class C state tournament. Other varsity letterwinners in 2012 were juniors Jessica Tisthammer and Paige Krohn and freshman Kyley Sorell.